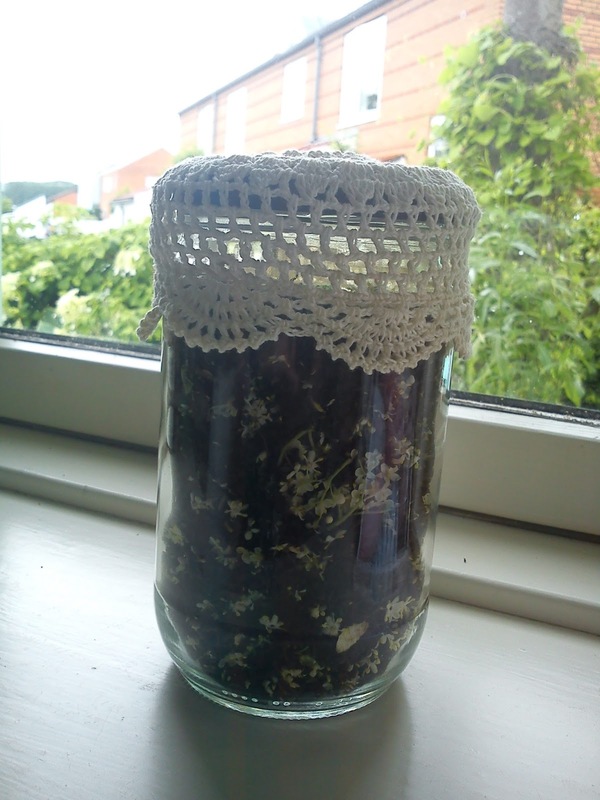 Two years ago I made my very first portion of this elder flower using a recipe by Camilla Plum for Politiken, and I have nothing left, so it is very right time to make a new portion of elder flower salt for later use in my little kitchen. If you try to dry this herb salt in the oven on low heat like 50-70'C, the un-blended elder flower will turn black, so do not try to this, unless you would like have black spot in your salt. It took it almost 4 days to dry the salt. 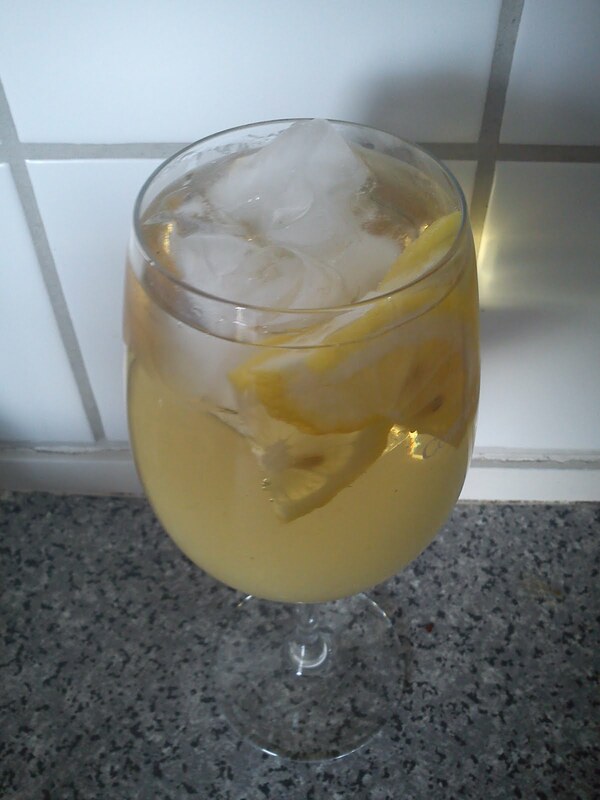 Start by removing the zest from the lemon. Split the chilies and remove the seeds. Cut of the flower heads from 10 stems of flower flower. Fill all these ingredients into a food processor and blend everything into rough looking herb salt. 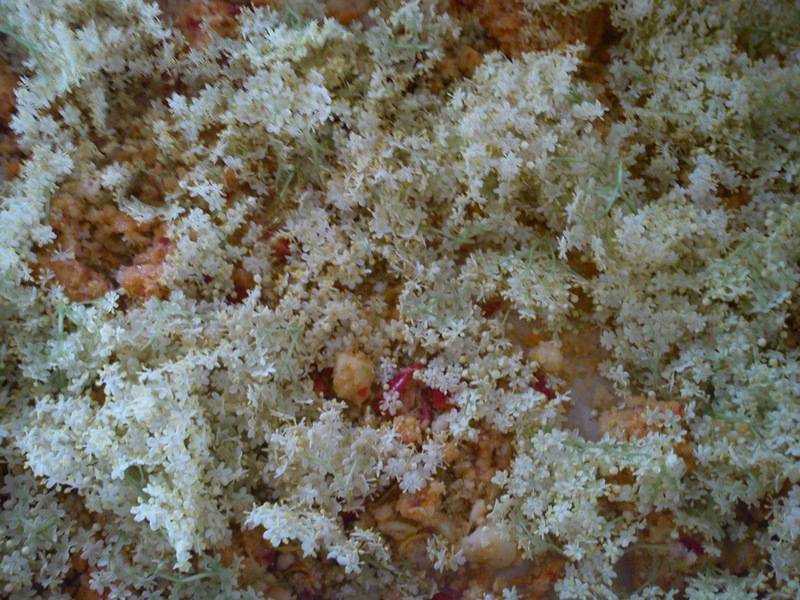 Fill the herb salt into tray/form and add in the rest of the elder flowers and let the salt dry. Cover the salt with a clean tea towel. The drying process can take it´s time, as the salt will drag the moist our of the other ingredients, before it finally dry. 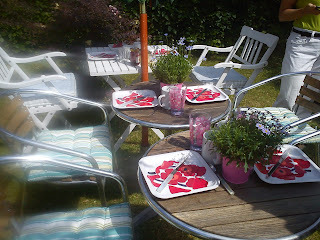 If possible you can dry the salt outside in the sunshine. 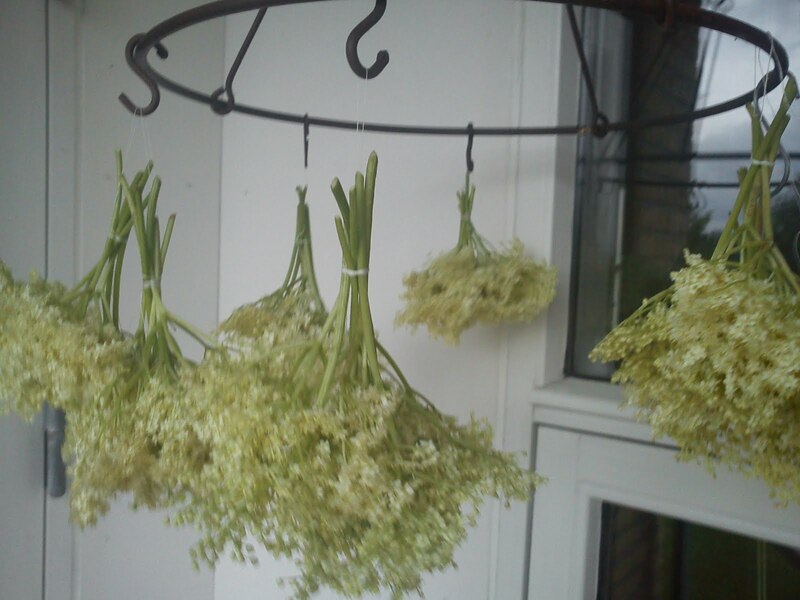 When the elder flower salt is dried, place it in air tight container. 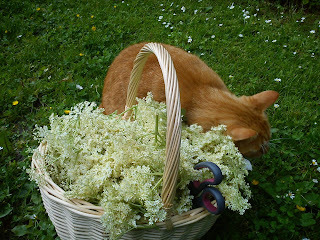 You can either use the elder flower salt, when it is moist. Otherwise it will last in it´s dry form for years. 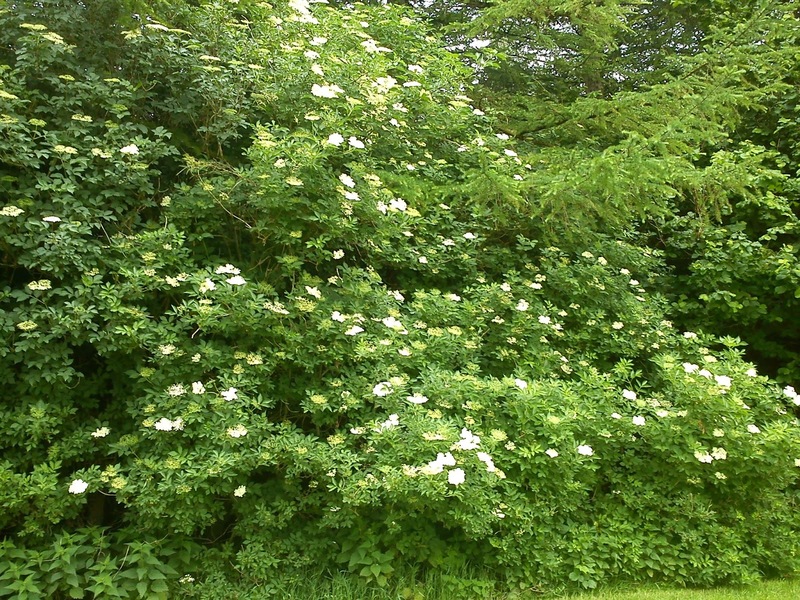 Last Christmas I made my very own Christmas Tea, so I decided it could be fun to make my very own summer tea taking inspiration from tea with fresh elder flowers, as such a summer tea would last longer than the season of fresh elder flowers. 2 weeks after I mixed this tea, I noticed, that the liquid from the elder flowers had turned the loose tea leafs into one big lump and at the same time I could see yeast growing in this tea !!!!! So please not make this tea yourselv !!!! I will be reworking this specific tea recipe to address this issue !!!! Cut the dried lime peel into small pieces. I used a scissor for this purpose. Mix the tea with the small pieces of dry lime peel. The elder tree are standing like Christmas tree full of bright lights in form of fragrant clusters of elder flowers along the roads, paths basically everything in the green surroundings here in Denmark. So it is time for you to pick your own elder flowers for making the following fantastic flavour full elderflower things in your kitchen. As usual Hannibal the Cat decided to join in on my hunt for elderflower in the surroundings, following me and my harvest basket like a little dog even though he is a cat ! 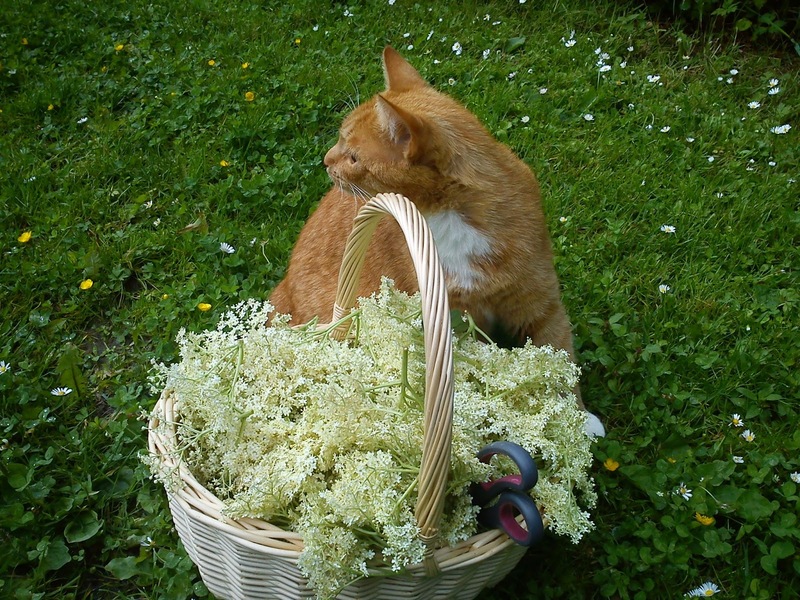 And when the harvest of elder flower was done, Hannibal the Cat was busy putting his scent-marks on the basket with elderflower by rubbing his head everywhere. We just managed to get inside again in my little kitchen, before it started to pour down with rain. 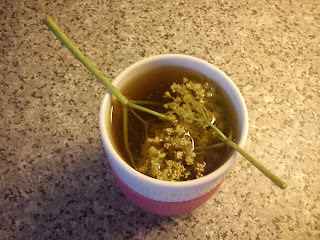 You can easily infuse your tea with elder flower. First you make your usual cup of black tea. Afterwards you infuse this cup of tea with one-two elder flowers for 1-2 minutes. It gives you a refreshing flower flavour. 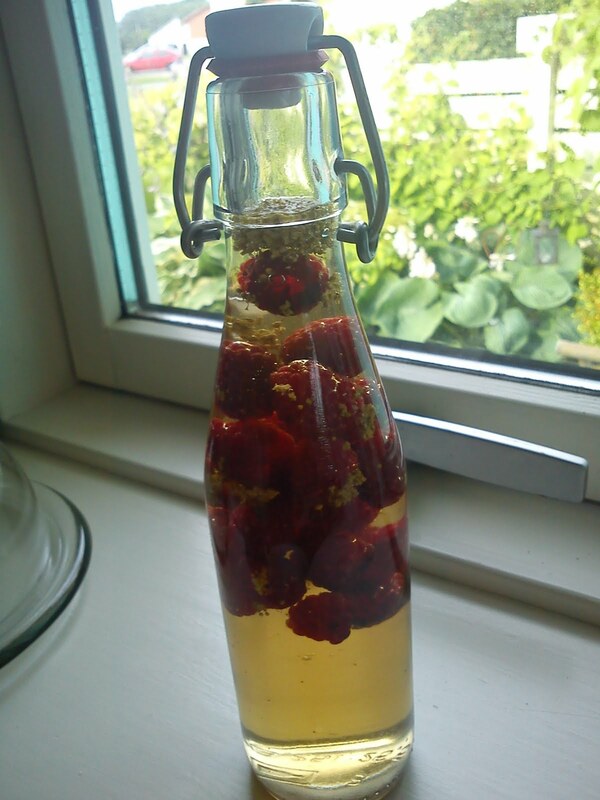 For cooking purpose in the kitchen you could try to make raspberry vinegar with elder flower. I will for sure make a portion of elderflower cordial a la Palle as usual, but I will also be making two other new recipe with elderflower as focus ingredients, so look into my virtual kitchen from time to time in the coming period, and I will share these new recipes with. However, I will already now share two clue with you: black tea and salt !!!! Do you have any idea, what I will be making ? 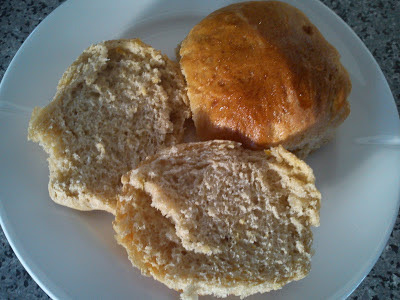 Using this recipe on tea buns as basic I decided to twist the recipe in the direction of squash buns, so I could use the last remaining portion of grated squash in the freezer from last years harvest surplus. And at the same time I could get some buns, which I can use for eating, when I having an evening rowing on the fjord going directly from work to the rowing club without break for an evening meal. As other suggestions on squash buns, I could also have baked buns using these recipes Lønnestræde´s squash buns or Lønnestræde´s bun wit squash and butter. 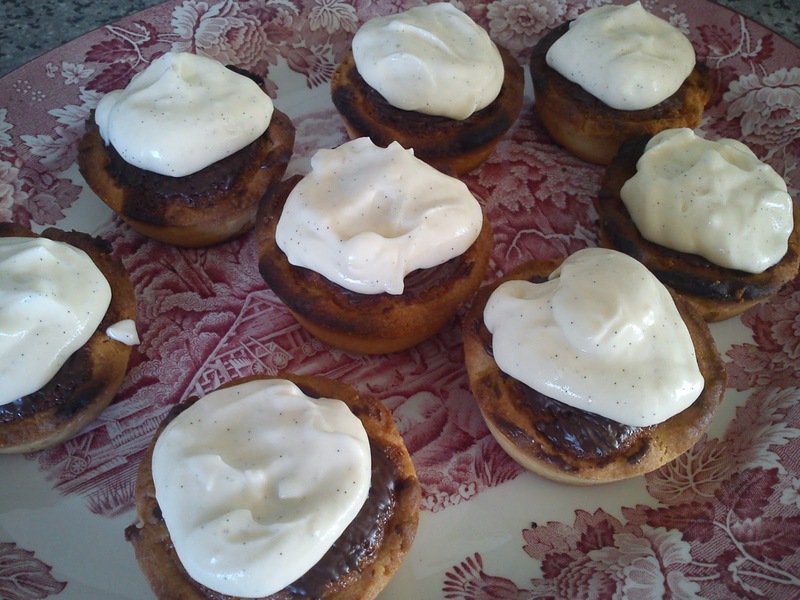 Anyway it endup with, that I baked these buns. Stir the yeast and cold milk together, add the melted butter into this liquid. Add the egg, salt, specie mix and sugar into this liquid. Add the wheat flour and the drained grated squash in. Knead the dough together, I usual knead for 10 minutes. Before baking the bun glaze them with an egg being together into a homogeneous mass. Bake the buns at 200'C for 15-20' minutes in the upper part of then oven. Lemon moon (citronmåne) is a classic Danish cake known by all Danes, mostly in the form of the commercial produced cake, which can itself for quiet many months still keeping it´s appearance. However, it is very easy to make your their own lemon cake, which will not last forever, as it is tasting too good. I have previously baked this version of a lemon moon cake using a recipe from "Te og kager året rundt". 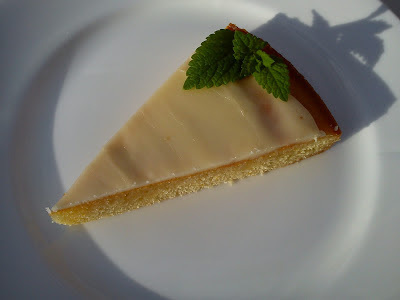 Sometime time ago I found another recipe on a lemon moon cake in a small cooking book in the weekly magazine "Alt for Damerne" made by Løgismose. 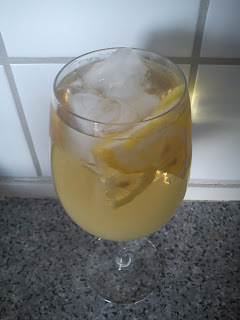 This version has an excellent taste of lemon, actually much more lemon taste than cake made from "Te of kager året rundt". Heat the (conventional) oven to 180'C. Melt the butter in a small cooking pot, add the lemon zest into the melted butter. Whip eggs and sugar together in a mixing bowl. Stir the egg-sugar mass, melted butter, flour and whipped foam together. Add the cake dough into a round form. Bake the cake in the middle of the oven at 180 for 35-40 minutes. Cook the lemon juice and sugar together to a syrup. After baking pinch the warm cake with a fork, pour the lemon syrup over the cake. Make the glazing from icing sugar and lemon juice, adjust the colour by addition of yellow colour. I got the recipe on paleo (stone age diet) chocolate cake from a rowing friend, which had baked it in connection with a picnic row. And this weekend I went away on another rowing trip, where one of the participants can not tolerate the use of milk products due to lactose intolerance, so I decided to bake this cake, so everyone in the boat could enjoy a piece of cake together. 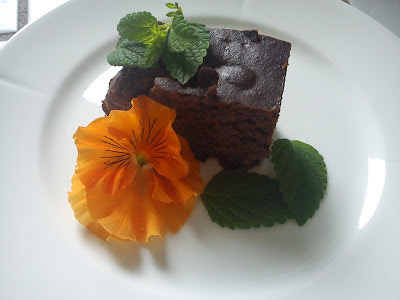 If you do not tell people eating this cake about the unusual ingredients used in this cake, they will eat the cake and assume it it a normal rich chocolate cake with plenty of butter, sugar and flour, so give it a try and be surprised. Blend the almond flour and dates together. Melt the chocolate and coconut milk/cream together in a small cooking pot on low heat. Mix it well together, so it looks like chocolate sauce. Stir almond flour/date mix, chocolate/coconut milk and egg-mass together in a mixing bowl, until the cake dough is homogeneous. Afterwards add it the cocoa powder, baking powder and vanilla corn into the cake dough. Line a baking tray (20x26 cm) with a piece of baking paper (so it more easily to get the cake out of the form after baking). Bake the cake in the middle of the oven at 180'C for 30-40 minutes. Check with a baking pin, that the cake mass is not liquid/moist, before you stop baking the cake. Cool down the cake before serving. 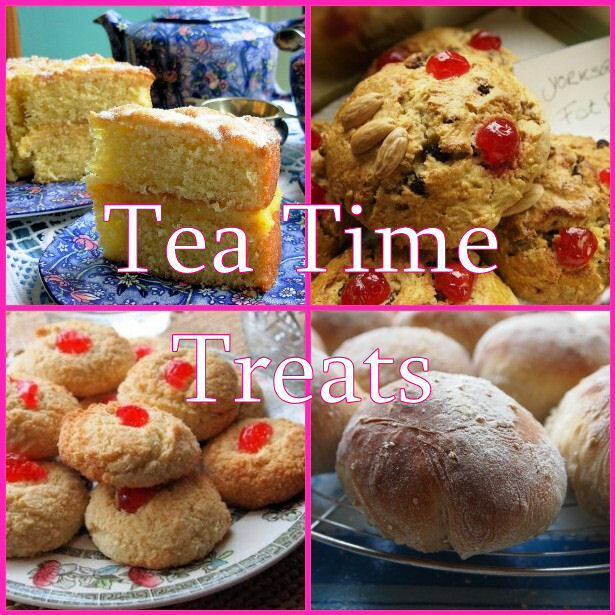 Tea buns is perhaps not the correct name, as these buns does NOT contain any tea, but they are excellent to enjoy together with a cup of tea or coffee, if you dislike tea !!! I found the original recipe in the cooking book called "Te og kager året rundt", but I have made three significant changes. The first modification is, that I have reduced the amount of yeast from 50 g to 25 g combined with doubling the first raising period. 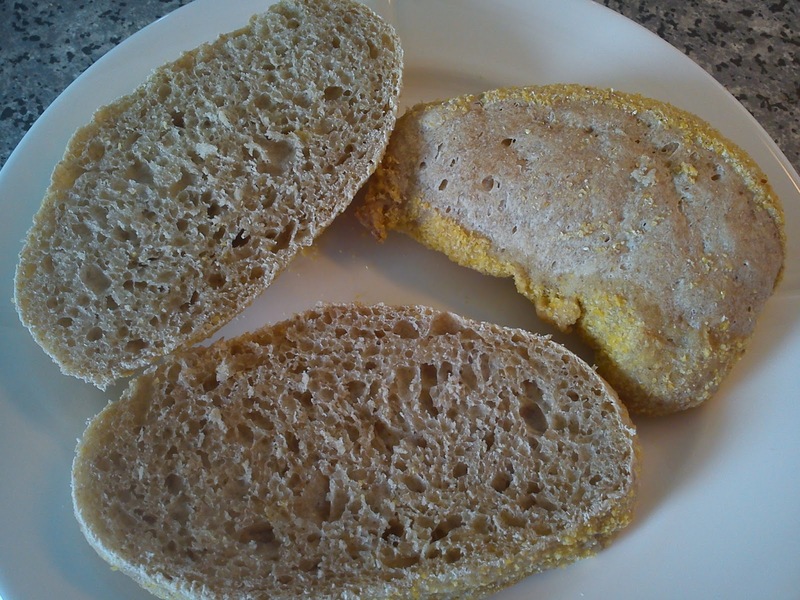 I have reduce the yeast amount in order to remove this yeasty flavour, which you sometimes find in buns/bread, where you are using 50 g yeast. The second change is, that I have increased the amount of flour in order to have get a certain ratio between flour and liquid, where the dough is not too moist or too dry. The "magic" ratio for me is 1000 g flour to 700 g liquid (liquid being milk, water, melted butter, yogurt, buttermilk etc). The third adjustment is, that I like to work with something giving a twist to the taste, this time in form of Mélange Pain d'épices, which is a mix of various spieces being cinnamon, anise, clove, ginger and cardamon. Bake the buns at 200'C for 15-20' minutes. The Tea Time Treat of June is hosted by Kate from What Kate Baked (being the hostess of the virtual tea table), and she selected layer cakes as the theme. 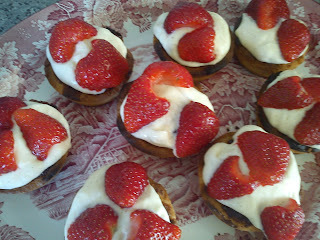 I have decided to bend the theme a little bit, so it is fitting to my fascination of strawberry cakes !! 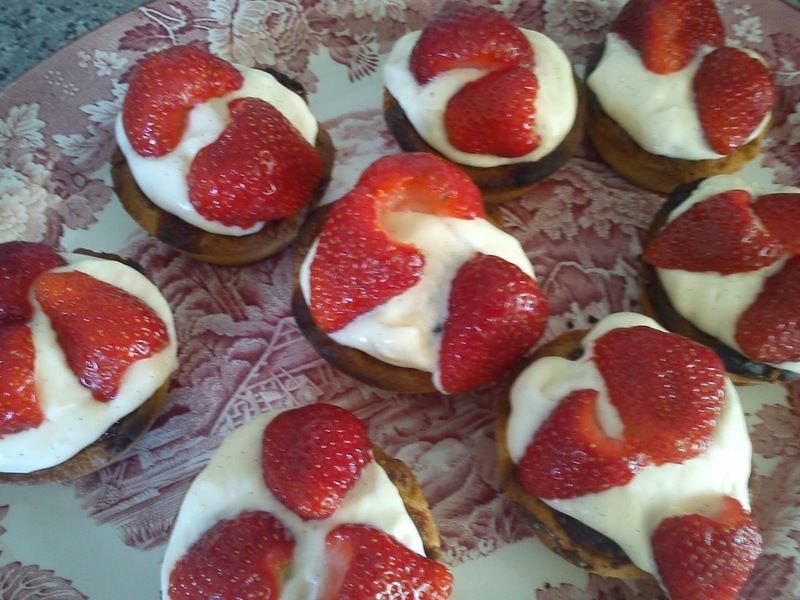 I love strawberry cakes, and they will from time to time tempt me, if I pass them at a bakery stall, even though that I find the bakers are demanding a too high price for them, 17 DKK for a small cake (single serving) or 60-70 DKK for the bigger version (cake for 4-6 persons). Strawberry cakes are for me equal to a wonderful Danish Summer with blue heaven, green trees, great tasting strawberries and plenty of wonderful daylight between 4 AM and 11 PM. Finally I have created The Ultimate Strawberry Cake !!!! after two years of hard work, both baking and eating :-) As the finishing touch I have been working with glazing of the final cake using the recipe from Strawberry cake version 4.0. A work colleague of mine suggested, that I should use a water spray for applying the glazing layer. I applied one layer, but after visual evaluation spraying four-five times would be highly recommended, so the glazing becomes more thicker and therefore more visual. Another option would be to use a brush for applying the glazing. Decorate with fresh strawberries cut into half. And place the cake cold in the refrigerator. Place the leaf of gelatine in a bowl of water for 5 minutes. Meanwhile mix the elderflower cordial and water together in a small cooking pot. After 5 minutes remove the gelatine leaf from the bowl of water and add it into the elderflower cordial-water mix. 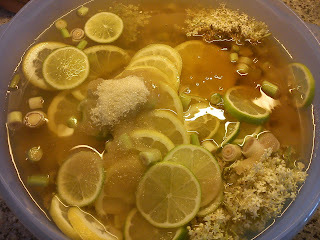 Gently heat up the elderflower cordial mix, until the gelatine leaf is melt, stir from time to time. Cool down the entire elderflower cordial-water-gelatine mix, apply it on top of the strawberries, using either a water spray (spray 4-5 times) or a brunch. Let the cake stand for minimum 30 minutes in the refrigerator before eating the cake. 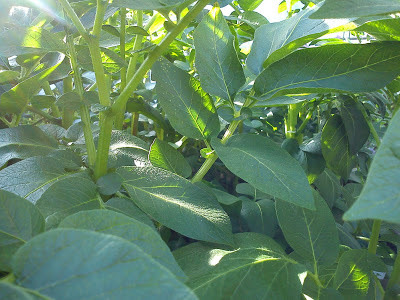 The potatoes, which I planted approx 6 weeks ago, have almost turned their potato pots in a green potato jungle !!! 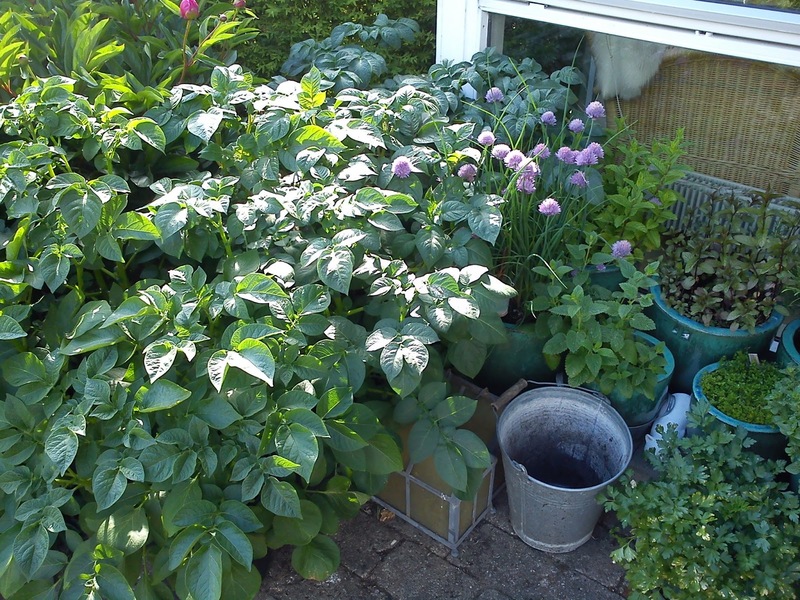 I have gentle looked into the inner pots to see, what is going in the earth, but it is still to early to start eating my own potatoes. 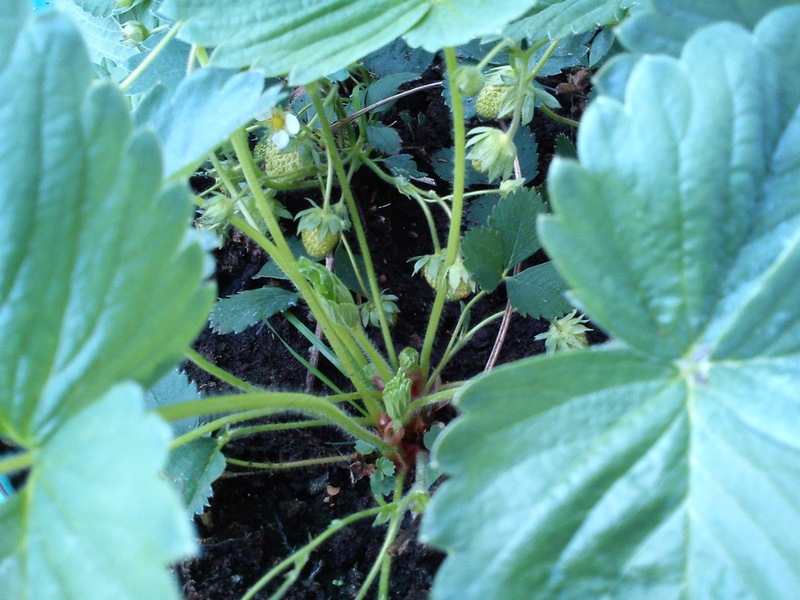 Also the strawberries plants are having small greenish strawberries growing, so more patience is demanded by me, before I can enjoy my own strawberries as well. And this week-end two small tomatoes plants moved into the terrace area, where they are standing next to the south facing house wall. 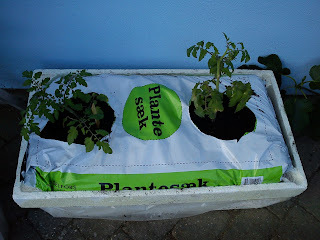 I have got hold of a cherry tomato plant and a balcony tomato plant. So no Greek tomato this year, after the Greek tomatoes declined to growth unprotected in the traditional Danish Summer. 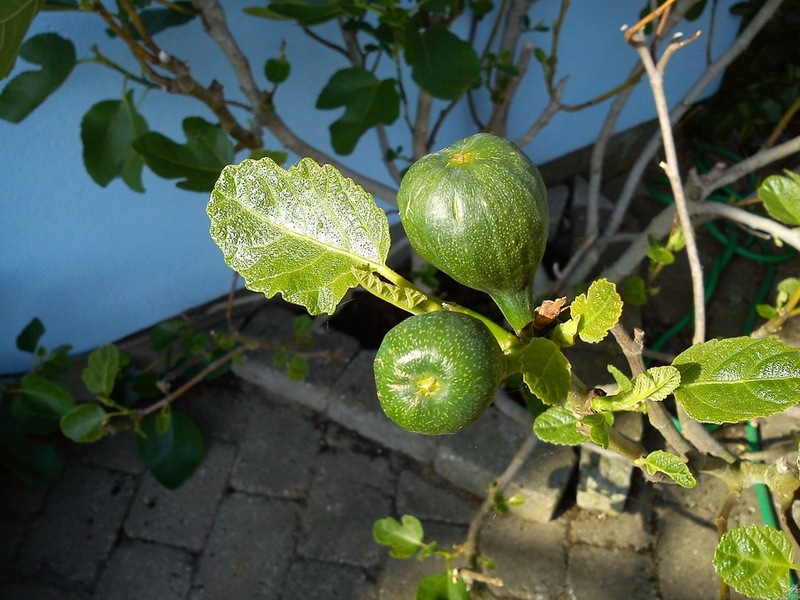 After two though Danish Winters in row, the fig has decided to stay in my garden for another year and I have noticed at least two small figs, which are growing on the fig. The two apple trees are also having small apples on them, so all in all it looks like a fruitful Summer in my little kitchen garden/park. Home-made lagkage - cream cake with layers inside - have you notice the pink colour everywhere ? Yesterday was a beautiful Summer day here in Denmark and I spend the afternoon drinking afternoon tea in my little "park" together with some of my great friends. We started off by having a sparkling drink, so we could toast and wish our "world traveller" welcome back in Denmark for a short remark, before she heads off again. 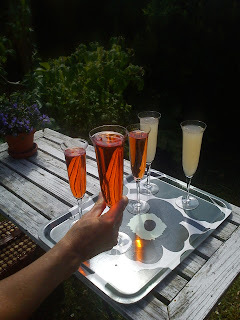 The sparkling were available both as non-alcoholic version in form of sparkling water with rhubarb cordial with orange and star anise or the alcoholic version in form of sparkling wine with the Italian Aperol. 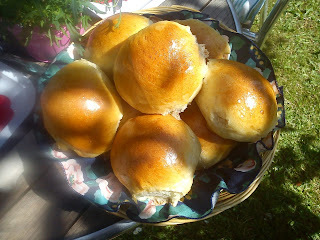 Afterwards we laid the bottom with a freshly baked tea buns (without any tea inside, but good company for cup of tea). 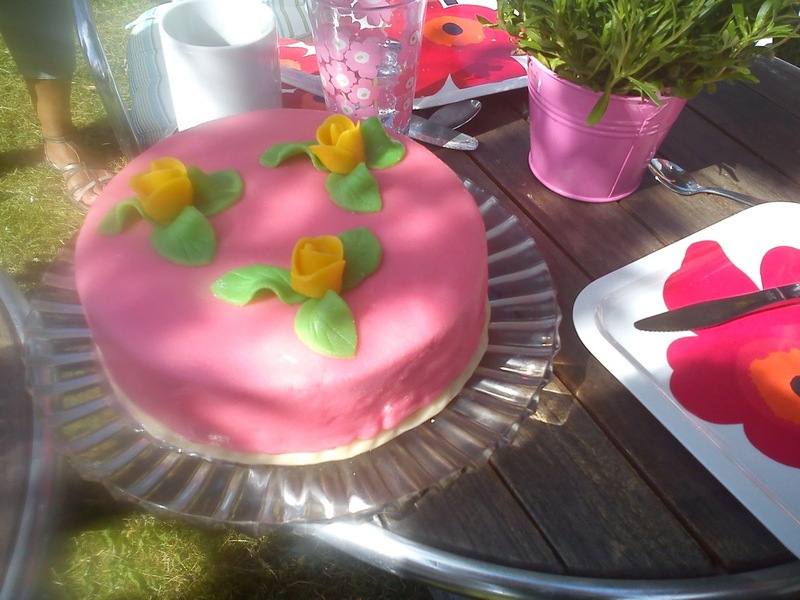 After the tea bun it was time for the first master piece of the afternoon - home-made cream cake with different layers inside and fantastic marzipan pink cover with three yellow roses. Great cake and a BIG thank you to the baker behind this cake. And this time I had locate the George Jensen cake knife :-) So no remarks from my good friends in Horsens about the lack of a cake knife !!!!! Well perhaps that you sgtill are missing the cake forkes ? The second master piece of the afternoon was The Ultimate Strawberry Cake. 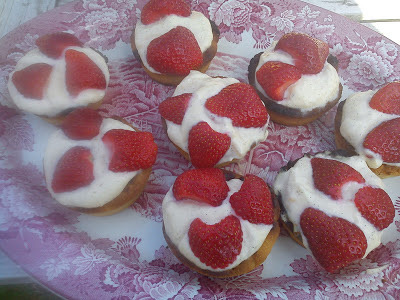 I will be sharing this cake recipe in connection with June virtual Tea Time Treat tea table, so here I have finished the quest of making the perfect strawberry cake. 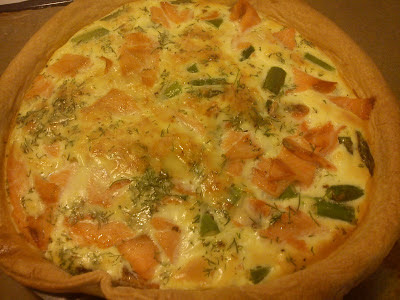 I have been making some future twist to this recipe on tart with asparagus and smoked salmon using another classic combination of asparagus and ham, as I really have a "salmon issue" being over feed with salmon in connection with business travels, so salmon stay from me !!!! And I definitely prefer this option with asparagus and smoked ham, so therefore I am looking forward to hear your comments to this recipe. I also decided to increasing the baking temperature from 180'C to 200'C, as I am person demanding faster speed for baking tarts. Place the pie dough in the pie form, cover the top of the dough with baking paper and place ceramic baking beans on top. Start by baking the dough with baking beans at 200'C for 12-15 minutes. Take the pie form out of the oven, remove the baking beans and bake the dough for another 4-5 minutes. While you bake the dough, you should prepare the rest of the tart filling. Pour boiling water over the asparagus pieces. 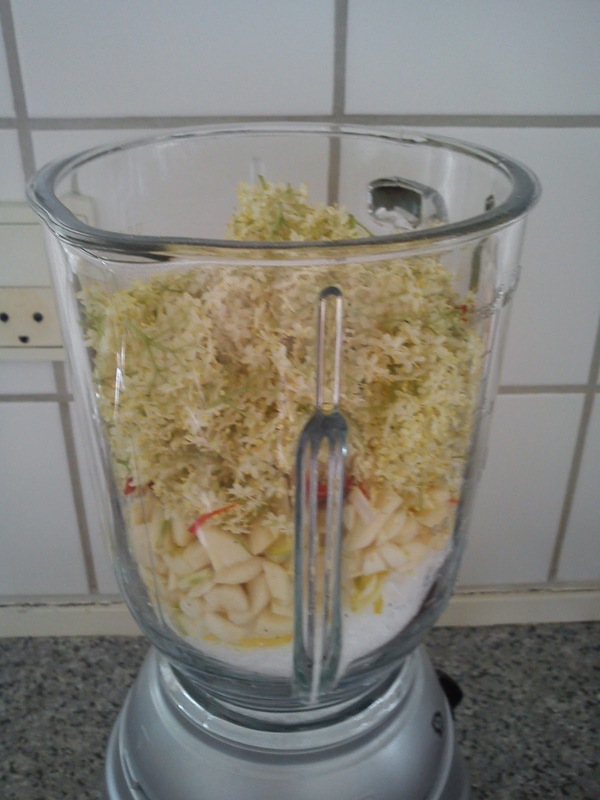 Mix grated cheese into the cream until the mix is homogeneous. Afterwards add into eggs and season with salt and pepper. 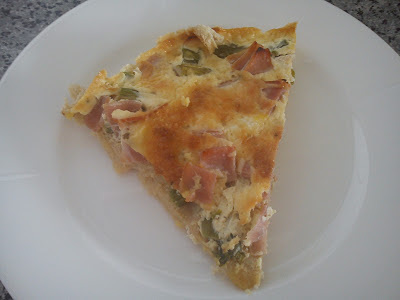 Fill the asparagus and smoked ham pieces into the pie form with the baked dough. Fill the cream-mass into the form as well. Bake the tart at 200'C for 35-45 minutes, until the tart is golden brow. Yesterday it was the Danish Constitution Day here in Denmark (5 June), and as usual I spend the day rowing on the fjord of Vejle all the way out (and back again) to the end point of the fjord on the Southern side of it, which is Trelde Næs, where you from Vejle Fjord can look down into Lillebælt (Little Belt) celebrating our freedom for assembly, freedom of speech and freedom of association. 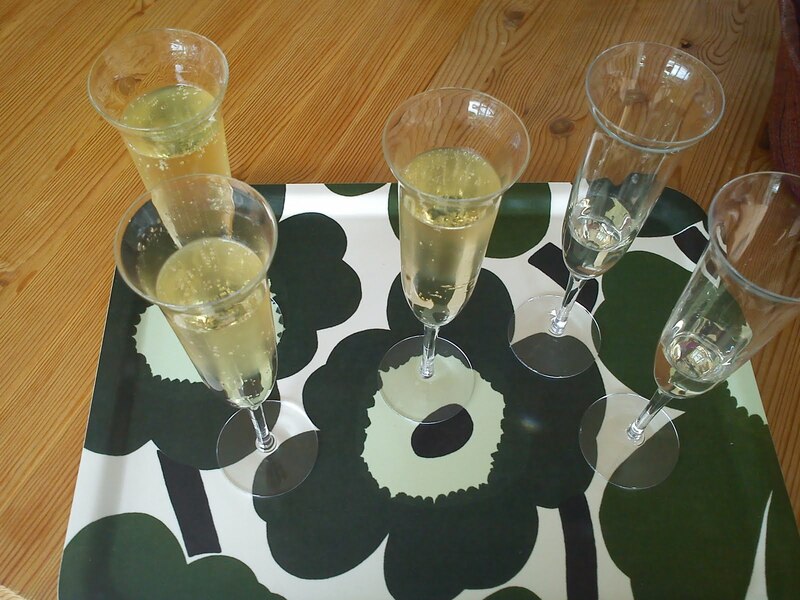 After a wonderful day spend rowing on the fjord we gather in my little park enjoying this Apple Martini. I have located this recipe in the the magazine Isabellas issue 2/2013. However, we found out, that we needed less alcohol in our blood, so the amount of apple juice was increased. Mix gin, dry Martini. 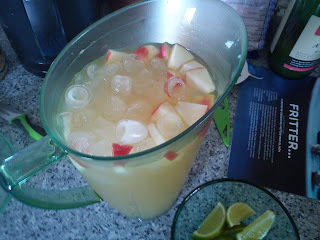 lime juice and apple juice in one big jug with plenty of ice cubes. Place apple pieces and lime boat in a high ball glass. Fill the Apple Martini into the high ball glass. Små citronbrød - small lemon breads from "Hjemmebagt"
Slowly I continue to bake my way through the excellent bread book "Hjemmebagt". I do not bake so much during spring and summer season, as I spending a lot of my spare time rowing on the water of Vejle Fjord = less time to bake bread and cake. 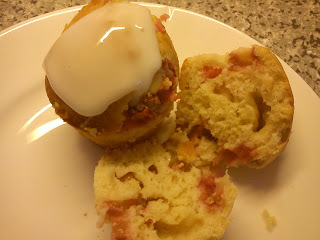 However, last Sunday quiet windy, so I decided not to go rowing, giving me some time to bake instead of. This time I bake some smaller bread/buns called "Små citronbrød" (small lemon bread), which are some sort of dinner rolls. The dough is made from fine sieved wheat flour and whole grain rye flour, salt, water, yeast and the peel of one lemon, which is a little unusual. I could smell the lemon, while baking the rolls, but the lemon taste is not dominating at all in the final dinner rolls. Perhaps addition of juice from the peeled lemon could increase the lemon flavour ? Before baking the dough is rolled into a roll, which is covered with oil followed by addition of corn flour as the decoration part. Afterwards the roll is sliced, and each slice is laid down with un-oiled surface facing upwards on baking paper prior baking. The dinner rolls will not be my favourite recipe in the future, as the word lemon mean, that I was expecting a more dominating lemon flavour/taste in the final rolls. In Country Living May 2013 issue I located this recipe on tart with asparagus and smoked salmon, which looked very tasteful on the picture in the magazine. My only concern was the use of salmon, as I have been feed too much salmon during various air travelling. Well, I decided to test the recipe out. The only change, which I did to this recipe was to make one big pie instead of several smaller pies. Therefore I have also increased the baking time in the oven. Cut the cheese into smaller pieces and mix them into the cream until they are homogeneous. Afterwards add into egg and dill. Season with salt and pepper. Fill the asparagus and smoked salmon pieces into the pie form with the baked dough. Bake the tart at 180'C for 50-60 minutes, until the tart is golden brow. 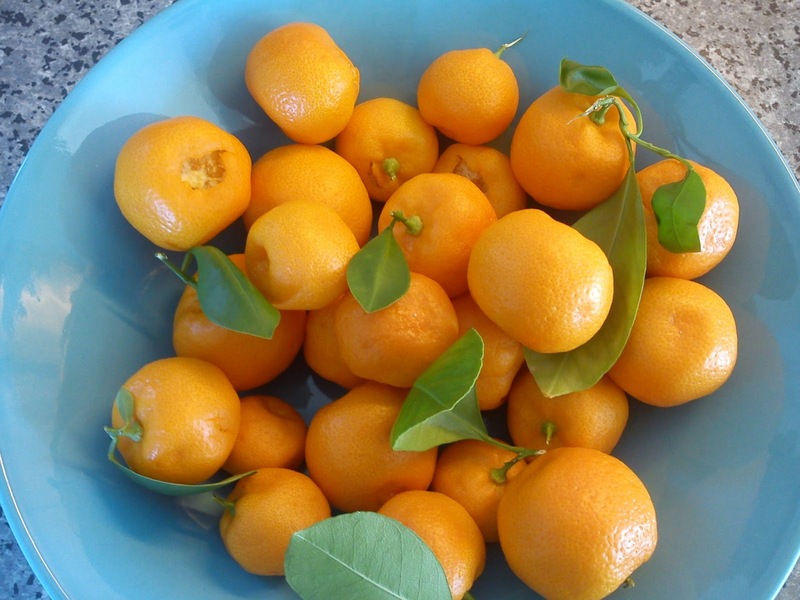 Last Friday a good colleague of mine greeted me upon arrival at work with a plastic bag full of small citrus fruits from a citrus tree in his green house. Sticking my nose into the plastic bag my nose was filled with a wonderful flavour of citrus :-) I knew at once, that I would these mini citrus fruits into jam using this method for making citrus jam. The only modification, which I made was to reduce the cooking time significantly to only 5-7 minutes due to the size of the mini citrus fruits. 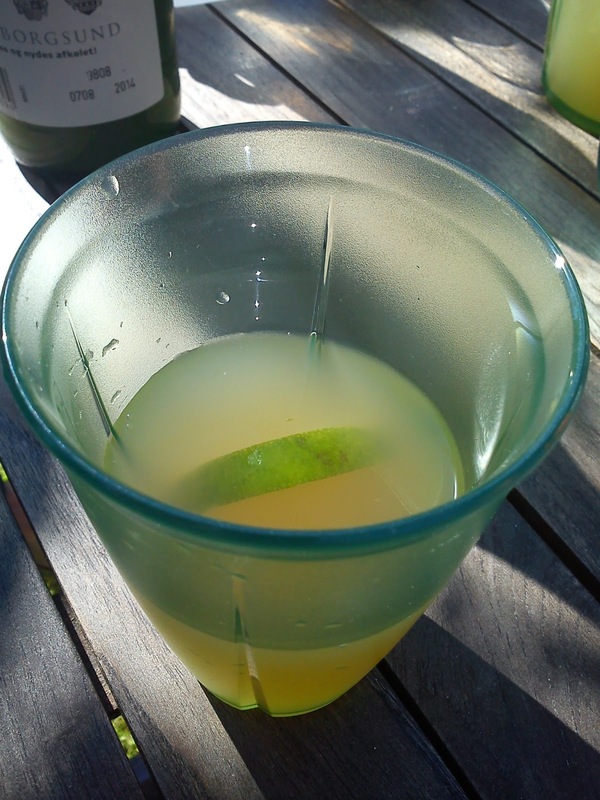 The final jam is quiet liquid/fluid, so the natural pectin level in mini citrus fruits was quiet low. Wash the mini citrus fruits. Place the mini citrus fruits in a small cooking pot, which when is filled with water. Place the lid on the cooking pot. Let the citrus fruits boiled (softly) for 5-7 minutes. 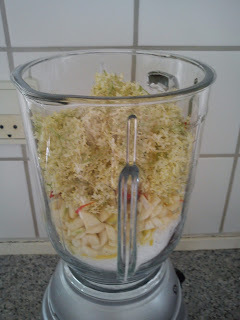 Remove the mini citrus fruits and place them in a blender. Add the sugar little by little, so you adjust the sweetness level to your personal preference.